With the release of SAP BusinessObjects BI 4.x, Crystal Reports remains the pixel perfect reporting standard. Its comprehensive SDK, and its security and embeddability make it ideal for distributing information to a wide variety of users across the enterprise. The APOS Migrator for Crystal Reports 2011 and 2013 allows you to scan your system for objects in SAP Crystal Reports 2011 and 2013, select them, specify new database connections in bulk, and convert them in bulk to objects in SAP Crystal Reports for Enterprise. The Migrator also gives you the option to replace the existing report, rename the new reports, or move the new reports to a different folder. 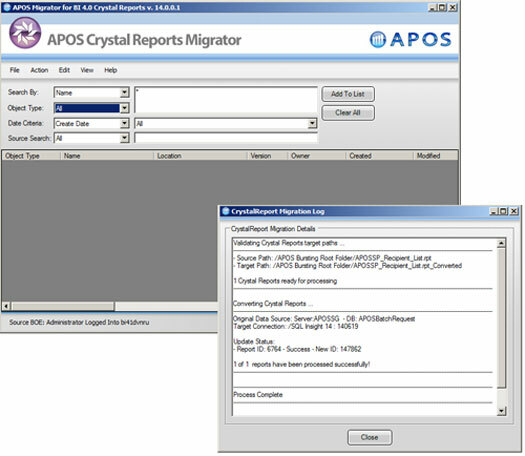 Like other APOS Migration Accelerator products, the APOS Migrator for Crystal Reports 2011/2013 allows migration planners and administrators to automate time-intensive and labor-intensive migration tasks, removing uncertainties from the migration planning process, and liberating resources to tackle higher-ROI tasks.